A fishing trip turned to tragedy when two Lisburn-based English soldiers were killed in a road crash with a tractor in Northern Ireland, an inquest has heard. 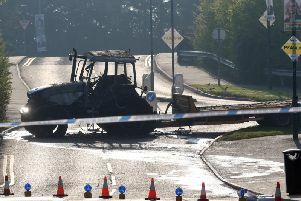 Lance Corporal David Gwilt, from Bedford, and Rifleman Dale Harris, from Barnsley, died when their car failed to stop at a junction in Co Antrim and ploughed into a tractor driving on a main road, Belfast Coroner’s Court was told. The 24-year-olds had been serving in the 2nd Battalion The Rifles, based at Thiepval barracks, Lisburn. One of their colleagues - Rifleman Matthew Robins - managed to escape major injury in the collision on the Ballyconnelly Road near Cullybackey last August. As relatives of the dead soldiers watched from the public gallery of the court, coroner John Leckey heard Mr Robins describe how the three had left Thiepval that morning with a plan to spend some time off fishing. They had gone to shops in Lisburn to buy fishing gear, fishing licences, food and a tent. Mr Robins sat in the witness box as his statement outlining the events of the day was read to court. He said the three friends had stopped at two lakes and were on the way to find another spot to fish when the accident happened. The soldier said he recalled being in the front passenger seat of the car as they drove along, but had no memory of the crash that followed. Mr Robins, also from England, later told Mr Leckey that none of the men were familiar with the roads in that part of Co Antrim. Jordan Marks was driving the tractor and trailer along the Ballyconnelly Road at around 8pm when the silver Fiat Punto, owned and driven by Mr Gwilt, emerged from a junction. “I just got a sight of a car flying out of the junction,” he said. The vehicle collided with the front of the tractor and spun around before crashing into a road sign. Retired doctor David Allen and off-duty nurses Rosaleen McLaughlin and Emma Donnelly were among the first to come upon the scene of the crash. Despite their efforts, the two soldiers were declared dead at the site. Road traffic collision investigator Gavin Dunn, from Forensic Science Northern Ireland, said the junction at the approach to the Ballyconnelly Road was clearly marked with signs and road markings. Recording the deaths as being the result of a road crash, the coroner extended his sympathies to the relatives of the two soldiers and again commended all those who had attempted to save them.